Motor Caravanners story in a 1916 copy of Chums comic. Homepage. This page: An old copy of Chums comic features a story relating to a WW1-era motor caravan. 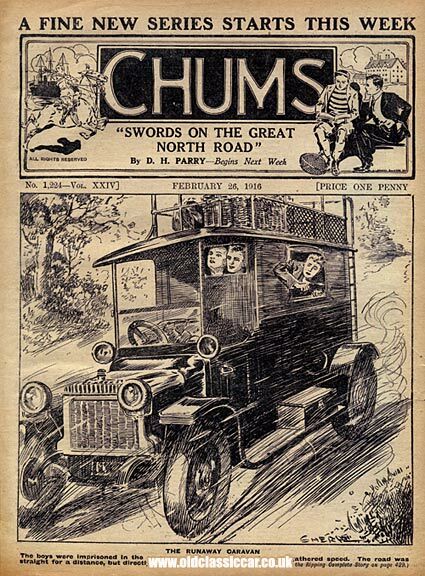 Motoring subjects often featured on the covers of children's comics from the 1910s until the 1950s, and this copy of Chums comic from February 26th 1916 is no exception. Illustrated on its cover is a Daimler (?) motor-caravan careering away down a hill, its young occupants trapped in the living area as it gathers speed at a terrifying rate. Priced at one penny, this is the earliest comic I've come across with a motoring theme to its cover, although undoubtably some concerted research would bring up others. At a time when the country was in the grips of the Great War, would the child who originally owned this comic have his or her father at home to read it with them I wonder? References to WW1 appear throughout the comic, not least in a section titled "Queer Items" which includes mention of rope-handle grenades, where the short length of rope is used to haul the cylindrically-shaped grenade through the air, in the general direction of the enemy line. Using it, the 23 oz grenade could be hurled some 50 yards away. Apparently the Canadians were keen on tying a coloured streamer to their grenades, so that it could be more easily tracked as it flew over in the direction of the enemy. "Before the second battle for Calais, the German officers taking part were required to register an oath that they would either succeed or die. Consequently these faithful interpreters of the bidding of their overlord used every endeavour to urge their men to fight most desperately. They told them that the Allies kept their prisoners with little food and clothing, ill-treated them, and shot them on the slightest pretext. Some of the more ingenious went a little farther and made scourges to urge their men on in the din of battle. One of these, taken from a dead German officer, was made from a walking-stick, with a short leather thong, attached to which was a heavy piece of wood into which nails and splinters of metal had been driven." The motor caravanners story appears several pages into the comic, a continuation of a series launched in a previous issue where a group of eager young chaps get into various scrapes and adventures, all written with broadening the imagination of its readers in mind, at a time when reading books and playing outside at every opportunity were both hugely popular pastimes for many a youngster. The electrifying journey down the hill on board the driver-less, free-wheeling, motor caravan as it gathered momentum is keenly described over several column inches, as the panic-stricken occupants locked within the back head towards an inevitable impact. ... What happened then was always misty in the memories of the motor-caravanners. There was a rending crash as the flying runaway tore through the wooden railings that fenced the moorland from the road where it curved, a nerve-shattering leap, and a crashing rattle of falling crockery as the caravan lurched over the bumpy moorland. Then Crawford's berth seemed to rise to life suddenly and hurl itself at Peter Ross, and a shower of plates and cups and saucers poured from the cupboard upon Roy Andrews' head." All jolly exciting stuff, the vehicle's occupants finally coming to a rest surrounded by the wreckage of the once fine vehicle. The remainder of this episode tells of how they tracked down the scoundrels that first locked them into the Daimler while they were asleep, then freed off their brakes before pushing them down the hill to meet a sticky end. There are no further references to motor-cars or vans elsewhere in this comic, but the entertaining story within its pages, coupled with the illustration on its cover, secured it a place on here. Return to the Motoring Collectables section for more motor-related literature.